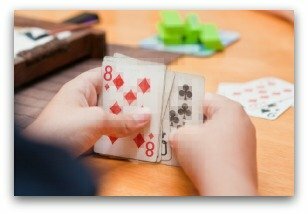 If you need a great math card game to use with your child or class, you'll find it here. I'll keep adding math games using cards from time to time so you can find a card game for a variety of math topics your students are working on. 20 Sum Addition: Kids will get practice adding and recognizing two, three, four, or five numbers that will have a sum of 20. Fraction-Decimal Match: Do your kids know equivalent forms for fractions and decimals. This fun matching card games reinforces the concept. Fraction Flip It: Students will want to play over and over again. A Great card game activity for comparing fractions. 24 Math Game: Here's a popular Order of Operations game that's played in many classrooms all over the world as well as at home too. It's great for getting students ready for algebra. Exponent Battle: Learning how exponents work is important for middle school and beyond. Your students will get a kick out of this one. Target: A game that teaches about using the Order of Operations is what this card game is all about. Players will try to reach the target number with five cards and the order of operations.